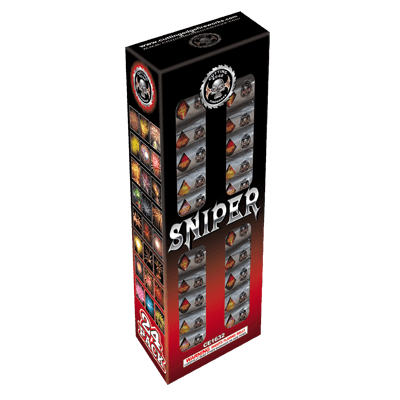 Sniper Shell Assortment – 24 shot canister mortar kit. Fires up to 250 feet in height with massive colorful bursts. All Up W/ Graceful Mine - This 8 pack of mortars fill the whole sky with an amazing mine to start, followed by some seriously loud and clean breaks! Crackling Artillery Shell w/ Tail - Six different artillery shells with various effects, beginning with tail and ending with crackling! Live Blast - Eight double-break mortar shots with varying effects! #100 Red Tube - Single-shot mortar tube. Image on packaging reflects the effect seen. Bombs Away Quad Banger - Each shell includes 4 totally different effects that separate in the sky to different points before bursting into a multitude of color and loud reports. #100 Green Tube - Single-shot mortar tube. Image on packaging reflects the effect seen. Firearm Shell Assortment - 12 Shot mortar. One of the newest mortar kits on the market with 12 different shells. King Arthur - 12 Mortar shot. Each shell is a different shot. Heights as much as 250 feet with a spread as wide as 200 feet.